We had the first session of our new member class today. During the first class, we do introductions and give a primer on Methodist theology. We had the fortunate problem of having too many people in the class so our introductions took up all but 15 minutes. 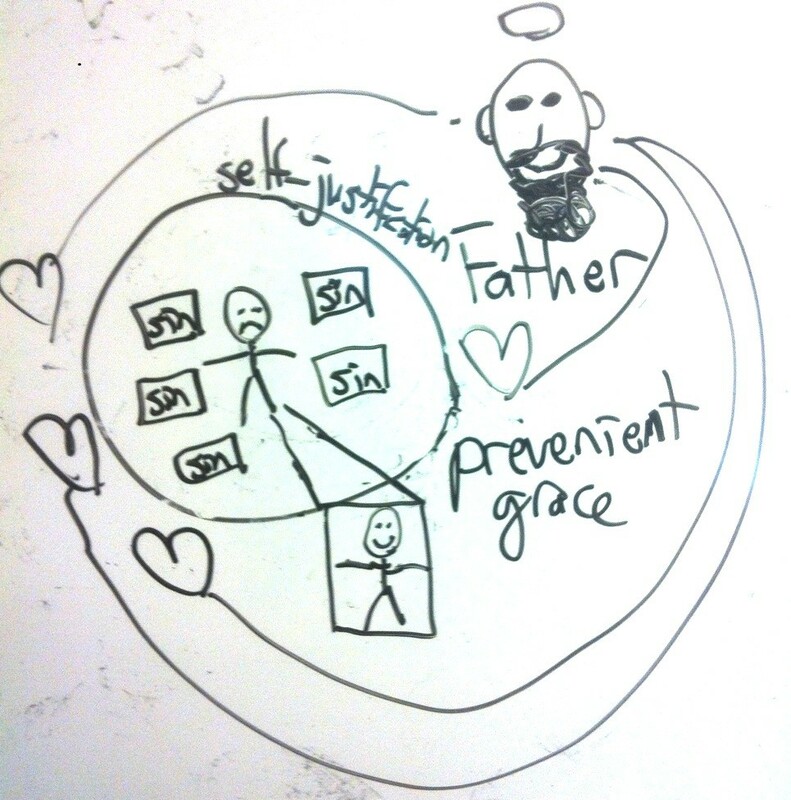 I didn’t want us to leave having only done introductions, so I tried to explain in 15 minutes and 4 stick figure drawings the three kinds of grace we talk about in Methodism: prevenient, sanctifying, and justification, along with the Christian perfection that God’s grace draws us toward. The way I’ve illustrated it is a bit individualistic (which of course I would have criticized if someone else had done it ;-)). I’m interested in hearing your feedback and suggestions for improvement. All of us are born with a condition that afflicts us before we’re self-aware enough to really make decisions for ourselves. Christianity has historically referred to this condition as “original sin.” Because of a lot of misunderstandings this term has generated, I prefer to label our originating condition “self-justification.” Simply put, we’re rational creatures who do irrational things. We want to make sense to ourselves and other people so we distort both our recollection of our mistakes and how we represent ourselves to others to put ourselves in the best light. 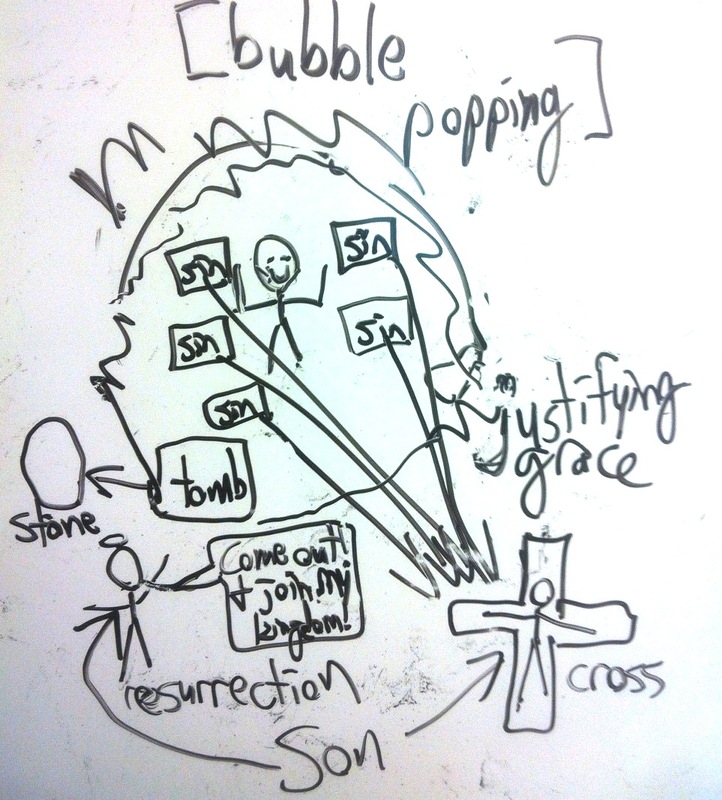 By justifying ourselves in this way, we generate a bubble around us that isolates us from God and other people. This bubble is not something we have the power to break on our own. Unless it is broken, we cannot experience God’s love or live in complete integrity with other people. Prevenient grace describes the patient love sent our way continuously by God the Father (who is called “Father” simply because He is the origin of everything and the member of the Trinity from whom the Son is begotten and the Holy Spirit proceeds). God is constantly using people and events in our lives to tap on our bubble and draw us closer to Him. What we believe as Methodists is that God has never not loved us and never stops loving us, even if we choose to stay inside our bubble of self-justification forever. This love is not merely a vague benevolent feeling, but a constant call into deeper intimacy with God and reconciliation with each other. Prevenient grace is God’s unilateral aggressive pursuit of every creature that He loves. Justifying grace describes the climax of God’s relentless pursuit of humanity through His incarnation in the second member of the Trinity known as the Son, God’s Word, or Jesus Christ. Jesus’ life, death, and resurrection are all essential to God’s process of reconciling humanity to Himself and popping all of our bubbles of self-justification. The centerpiece of justifying grace is the cross. Jesus’ sacrifice for our sins on the cross gives us a place to put everything that we have done and received that causes guilt and resentment (our sins and sins against us) so that our bubble can be popped forever. When we have renounced self-justification and put our trust in the justification of Jesus’ cross, then we can proactively embrace and even rejoice at the correction and refinement the Holy Spirit works in our hearts, which is called sanctifying grace or just sanctification. Galatians 5:22-23 talks about the fruit of the Holy Spirit, which are “love, joy, peace, patience, kindness, generosity, faithfulness, gentleness, and self-control.” The Holy Spirit cultivates these qualities into our character over time as we unlearn our innate tendency to argue that we’re already perfect and grow in our ability to surrender and trust. The Holy Spirit basically declutters our heart and takes the sin boxes to Jesus’ cross where they are incinerated. In addition, the Holy Spirit reveals to us our spiritual gifts (such as prophecy, teaching, evangelism, healing, etc) and the place within Christ’s body for which we have been prepared. Christian perfection is the state of having all the fear and self-justification driven out of your heart so that your motivation for every act is love of God and neighbor. You still might not do the right thing every time, but Christian perfection would mean your heart is always in the right place. John Wesley asked all of his pastors a question that makes Methodist pastors today squirm a whole lot: “Do you expect to be made perfect in love in this life?” If you answer no, then you can’t be ordained. But the terms in which 21st century pop-evangelicalism describes sin makes it seem like a heresy to say yes. It’s a paradoxical question to consider, because what it really asks is not whether we have the ability within ourselves to not make any mistakes, but whether we trust in God enough to believe that He can kill all of the selfish sinful motives in our hearts and fill us completely with love. If you don’t believe in Christian perfection, then you’re saying God has a different purpose for humanity than making us one with Him and each other by perfecting us in love. Some Christians say God’s purpose is to “glorify Himself,” feeling that God’s sovereignty can only be absolute if He is ultimately aloof from the fate of His creation. Some would argue that describing the triumph of love as God’s most fundamental goal depicts God as being “co-dependent” on His dysfunctional creatures and less than fully in charge. I can appreciate this concern (as well as the fact that I depict it imperfectly). But as a Methodist, I would say that God does indeed glorify Himself through perfecting the world in love since that is how the Bible explains His nature (1 John 4) and His goal for creation (John 17). 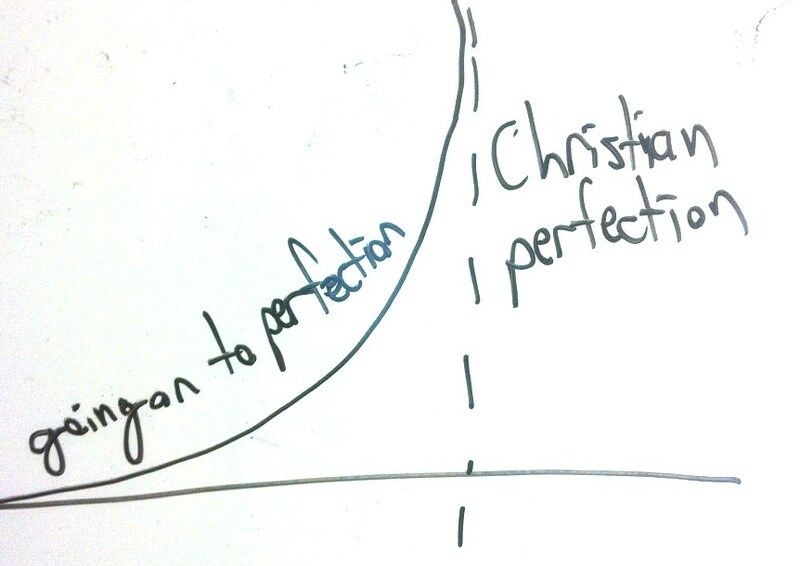 The way I illustrate Christian perfection is through calculus: the graph of a hyperbolic curve. A hyperbolic curve starts with a slope of zero (a flat horizontal line) and increases over time to a slope of infinity (a flat vertical line). It’s impossible for a curve ever to become a straight-line, but it can get closer and closer to a straight-line over the course of an infinite distance. Christian perfection is the straight-line that our curve approaches as God sanctifies us. The more that we trust Jesus and allow the Spirit to transform us, the more we will “go on to perfection,” as John Wesley would say. If we are ever perfected in love, we won’t notice it because noticing it shows that we are still taking pleasure even slightly in our correctness which indicates the residual presence of that bubble of self-justification that needs to get popped again. Love is only perfect as a grace which passes through us, “a light which shines through the darkness without being seized by it” (John 1:5). If I grab it and say mine (which I have never not done), then I haven’t yet arrived. I believe that God has the power to perfect me with His love. I also know that I am not there as long as there is part of me that continues to perform instead of worship. 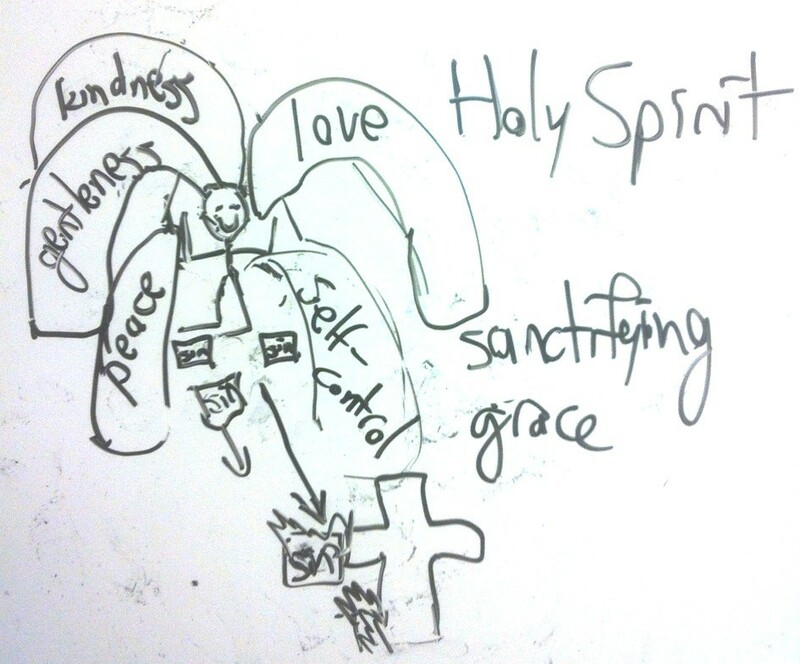 This entry was posted in Theology and tagged 1 John 4, Christian perfection, Galatians 5:22-23, God, Grace, Holy Spirit, Jesus, John 17, John 1:5, John Wesley, Justification, Original sin, Prevenient grace, sanctification, Self-justification, Trinity, United Methodism. Bookmark the permalink. Really nice job in 15 minutes. i’m impressed. Of course, you are more than aware of the way you translate the concept of original sin into your own vernacular. Once you make that first move, your descriptions do a really nice job of quickly capturing the different kinds of grace. My only qualms at all about your presentation are on both ends. Wesley said he knew people who were perfected in love (contrary to what sometimes get said), although I’m not aware of him ever claiming it for himself. It was not to his mind an unapproachable line. That description of it, I think still falls prey to the notion that “perfection” means more than perfected in love and is therefore not possible. On the Prevenient Grace side, I don’t fault anything you write, but I think there is more depth there — which is probably not fair to bring up when you are trying to do all this in 15 minutes. Prevenient Grace restores to us an ability to respond to God. It is not only God poking on our bubble, but it is God doing something in us. 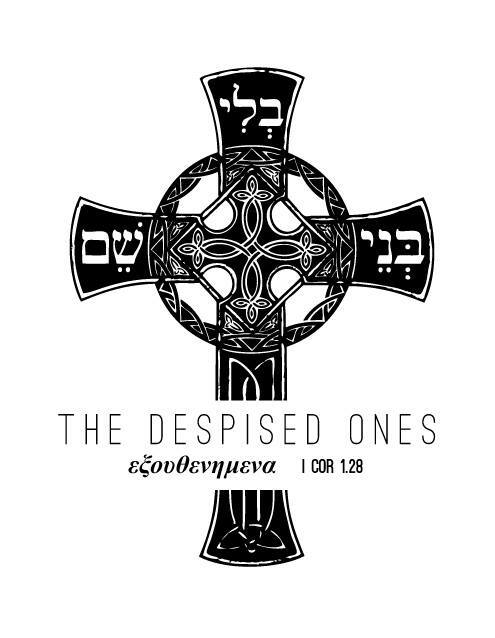 It also serves as the conscience that pricks us in the soul toward repentance. I’m not sure if this is helpful feedback. I hope it is. Thank you for inviting me to comment. Maybe prevenient grace is God is chiseling away at the bubble so that when it pops, it’s justification! Regarding Christian perfection, perhaps my Baptist upbringing is still holding me back from allowing myself to believe that it has actually happened as opposed to believing that I should trust God can do it which I’m more comfortable with. mmm… I think maybe I’m a Methodist! Pastor Guyton, my church and many Evangelical churches teach that God’s ethical standard for humanity demands perfection. Because God is Holy, He cannot tolerate any sin. Since we have sin, we fall short of God’s perfectionist standard. That’s why we need Jesus to die for us. This strikes me as odd. If God knows that we have a tendency to sin, why does he impose such a harsh standard on us in the first place? It’s like punishing a 5 year old child for failing a calculus test. Where did this kind of teaching come from? Is there another way to understand the Gospel?